Provides a natural extension of the refreshing and sophisticated Kate Spade aesthetic. Inspired by a chic and timeless style, the collection evokes the 60’s in terms of design and color. With daring and sophisticated collections, ophthalmic and sunwear has become women’s favorites in designer eyewear. Kate Spade created her company in 1993, selling handbags. In 1996, the first boutique opened in Manhattan, and this began her transition from a handbag designer to a fashion icon for all types of apparel and accessories. 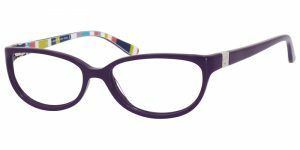 The Kate Spade collection is available at Good Looks Eyewear. Visit Our Pittsburgh or Cranberry Township location to pick up your glasses or sunglasses.